In Records > Elvis Presley Records > Show & Tell. The LP record cabinet has dividers and opens down to display the records . It is not the fanciest one but it works for me . 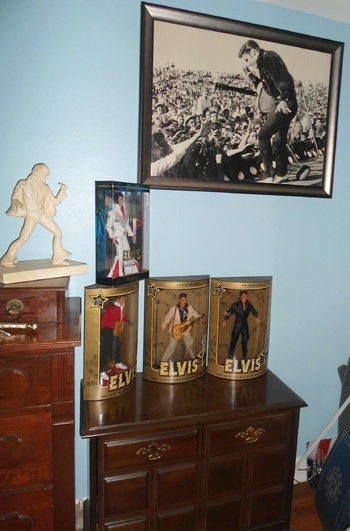 And there are the Elvis dolls too along with large photo live on stage. 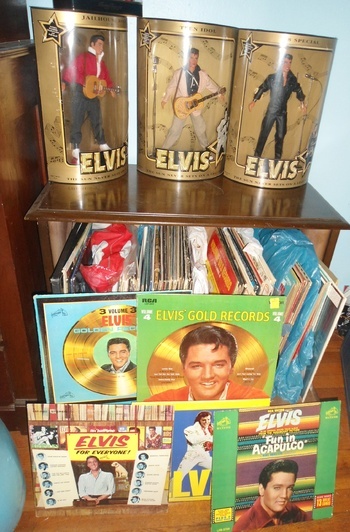 awesome collection of the "KING OF ROCK AND ROLL!!!" Ok brunswick but this is a mere sample lol I used to have a whole basement wall full of LPs I nearly had to pay the dealer to carry therm out :-) anyway when I moved no one would help me with moving them all so sadly sold them . I did make and record many to CDs from my record player which I still have 2 of them and often play 45's on it because it is in front room and can keep more 45's in my small cabinet and change them out from time to time . Ok I will look for one you posted and let you know ok in meantime I just recorded a song from a LP on video to show you my set up . If you look close you will see a sign it was for you :-) Not song but how my recording system works . That's an impressive collection you have. My wife's mother was a huge fan of Elvis. I remember her saying he, could put his shoes under her bed any time! Great collection Mani! I remember the very first album I bought with my own money was an Elvis LP. I must have been 8 years old, right around 1970. Your post shook loose a fun memory out of this old brain. Thank you... thankyouverymuch. I especially like the large photo! HELLO MANI MY FRIEND !!! I'M BACK !!!!! 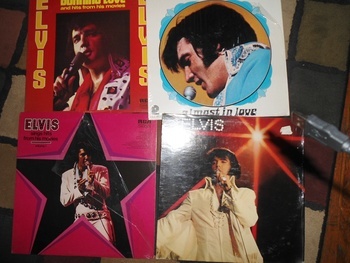 I LOVE THESE ELVIS RECORDS !!!!!! brunswick my camera video doesn't do a good sound quality and that was the first time I tried it Normally under record player there is a unit that records a 45 ,LP,tape cassette, 8 track or reel to reel to cd . Somebody loves Elvis Mani... and so do I! Thanks for sharing! Thanks Rick :-) always nice to see a fellow collector of something posted relate to it ! Beautiful, I suspected a shrine like this in your cave, tribute to the King of Rock and Roll by the Queen of CW. Thank you bladerunner22 It actually is a room in progress doing some painting and not to organized at moment . But Yes I have my Woman Cave :-) I appreciate your kind comment . I was just listening to that very song :-) That is funny but I was . A m a z i ng! My uncle recorded two songs at the Graceland studio of him in Elvis costume. He went by himself and is the biggest of Elvis fans sings Karaoke twice a week only Elvis songs. 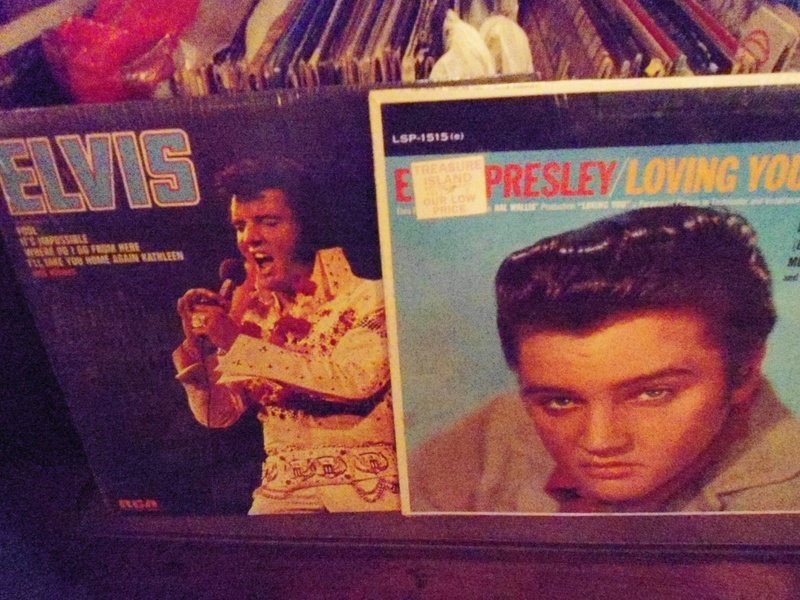 Suspicious Minds is in my top ten. Great collection.